Warhol, photographed by Steve Wood, 1981. Andy Warhol (born Andrew Warhola; 1928–1987) was an American artist, director and producer who was a leading figure in pop art. Warhol made over 100 movies between 1963 and the late 1970s. Screen Tests, 1964. Features Marcel Duchamp, Bob Dylan, Salvador Dali, Dennis Hopper, and others. Films about Warhol on UbuWeb. with Gerard Malanga, Screen Tests, New York: Kulchur, 1967, 115 pp. The Philosophy of Andy Warhol (From A to B & Back Again), written by Pat Hackett and Bob Colacello, New York: Harcourt Brace Jovanovich, 1975.
with Pat Hackett, POPism: The Warhol '60s, New York: Harcourt Brace Jovanovich, 1980, 310 pp; repr. as Popism: The Warhol Sixties, Penguin, 2009. Memoir. The Andy Warhol Diaries, ed. Pat Hackett, Grand Central Publishing, 1991. I'll Be Your Mirror: The Selected Andy Warhol Interviews, ed. Kenneth Goldsmith, New York: Carroll & Graf, 2004. Peter Gidal, Andy Warhol: Films and Paintings, London: Studio Vista, 1971, 160 pp; new ed., 1991. David Bourdon, Warhol, New York: Abrams, 1989. Victor Bockris, The Life and Death of Andy Warhol, New York: Bantam Books, 1989. 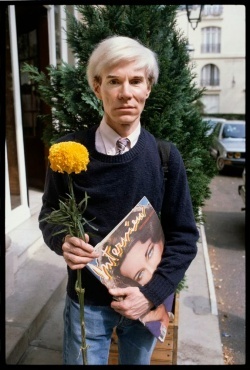 Klaus Honnef, Andy Warhol, 1928-1987: Commerce Into Art, Taschen, 2000. Annette Michelson (ed. ), Andy Warhol, MIT Press, 2001. Wayne Koestenbaum, Andy Warhol, New York: Viking, 2001. Linda Bolton, Andy Warhol, London: Franklin Watts, 2002, PDF, ARG. Steven Watson, Factory Made: Warhol and the Sixties, New York: Pantheon, 2003. Arthur C. Danto, Andy Warhol, Yale University Press, 2009. Tony Scherman, David Dalton, Pop: The Genius of Andy Warhol, New York: Harper, 2009. Gary Indiana, Andy Warhol and the Can that Sold the World, New York: Basic Books, 2010. Douglas Crimp, "Our Kind of Movie": The Films of Andy Warhol, MIT Press, 2012, xv+171 pp. Collection of Crimp's essays on Warhol's films. Lucy Mulroney, Andy Warhol, Publisher, University of Chicago Press, 2018, 193 pp. Andrew Higgins, Miroslava Germanova, "Andy Warhol Said He Came From ‘Nowhere.’ This Is It", New York Times, 7 Oct 2018. Andy Warhol Museum, Pittsburgh, Pennsylvania. This page was last modified on 1 November 2018, at 20:29. This page has been accessed 20,324 times.